The prime minister’s warning comes ahead of a Commons vote later on whether to ask the EU for permission to delay Brexit beyond 29 March. MPs will vote on a government motion which could see a delay to the UK’s departure from the EU. The UK government said there could be a short delay until 30 June, if MPs approve Mrs May’s deal by 20 March – the day before the next EU summit in Brussels. But BBC political editor Laura Kuenssberg said that even if the UK is given until the end of June to pass the legislation required to leave the EU, the government will try to do that earlier, if Mrs May’s deal is passed next week. 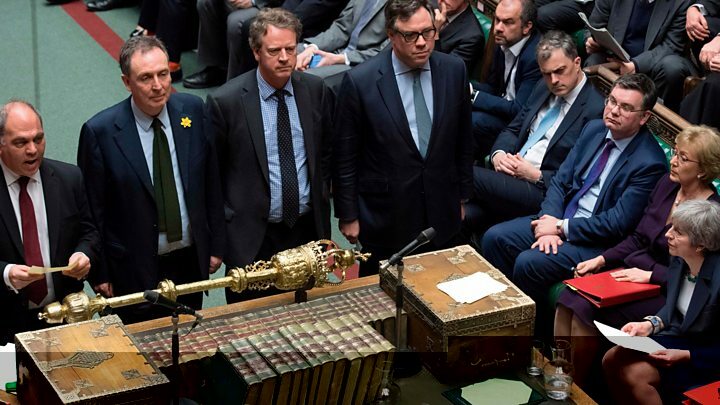 That meant the government’s original motion – which had stated that the UK should not leave the EU without a deal on 29 March – was changed at the last minute. On Thursday morning, European Council president Donald Tusk tweeted that he would “appeal to the EU27 to be open to a long extension if the UK finds it necessary to rethink its Brexit strategy and build consensus around it”.